The VM Agent must be installed on virtual machines (VMs) in order to enable data collection. Azure Security Center enables you to see which VMs require the VM Agent and will recommend that you enable the VM Agent on those VMs. The VM Agent is installed by default for VMs that are deployed from the Azure Marketplace. The article VM Agent and Extensions – Part 2 provides information on how to install the VM Agent. This document introduces the service by using an example deployment. This is not a step-by-step guide. In the Recommendations blade, select Enable VM Agent. This opens the blade VM Agent Is Missing Or Not Responding. This blade lists the VMs that require the VM Agent. Follow the instructions on the blade to install the VM agent. Setting security policies in Azure Security Center--Learn how to configure security policies for your Azure subscriptions and resource groups. 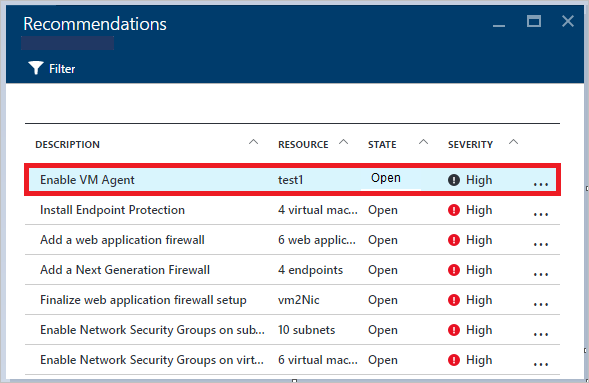 Managing security recommendations in Azure Security Center--Learn how recommendations help you protect your Azure resources. 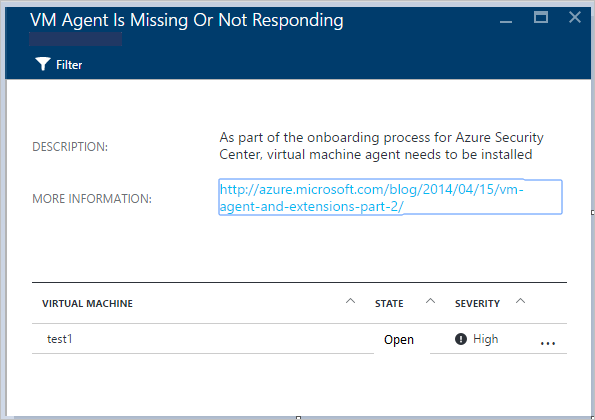 Managing and responding to security alerts in Azure Security Center--Learn how to manage and respond to security alerts. Azure Security blog--Get the latest Azure security news and information.